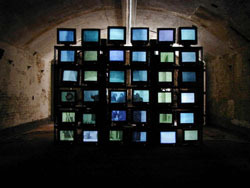 We installed the Networked Lowtech Video Wall as part of the Fort Lux exhibition at Fortress Ijmuiden, in Northern Holland. The exhibition was organised by Kunst en Cultuur Noord-Holland and ran during June and July 2000. The location for the exhibition is extraordinary - an underground complex on an artificial island. At first sight Fortress Ijmuiden appears to be an unremarkable cluster of concrete bunkers, but below the surface is a maze of underground corridors and rooms designed to house 300 troops. The fortress was built in the Napoleonic era and the island on which it is located is now a world heritage site. A single moving image is distributed across the 36 display screens in 480x150 resolution streaming ASCIIvision. In other words, the image that you see is made up of 72000 text characters, updated five times per second. (Each screen displays 25 lines of text, each 80 characters wide - our text-pixels are twice as high as they are wide.) The images themselves are video fragments from the "Doom"-like tunnels and chambers inside the fortress. The picture is fluid and mobile - not at all jerky. When you are near to the installation then each computer seems to be spewing out screenfuls of meaningless text - but as you move away the single movng image becomes clear. Who says you can't do streaming video with trash technology? You my be interested to view the back of the instalation. All the hardware cost virtually nothing! The 37 machines and monitors that we used were donated to Redundant Technology Initiative, and we also successfully scrounged the 10-base-T network (everyone's upgrading to 100-base-T nowadays). The 36 display clients are 486/25's and 486/33's and the image server is a 486/66 with 16mB RAM. The software that makes the installation run was created by programmers Tony Goddard and Matt Palmer. The two principal components of the software, the image server (which streams UDP packets, if you really want to know) and the client software run under Linux, the free operating system. Ingeniously, the image server is also a client server - so we can take a trash machine with no software at all, connect it to the newtork and boot from floppy create another section of the display. This is very useful when machines fail. The installation was physically constructed and activated by Ian Richardson and James Wallbank. Special thanks must go to Ian for his frantic debugging efforts during the testing of the piece. Thanks must also go to all of our computer donors and to the many other people who who contributed to the realisation of this work.